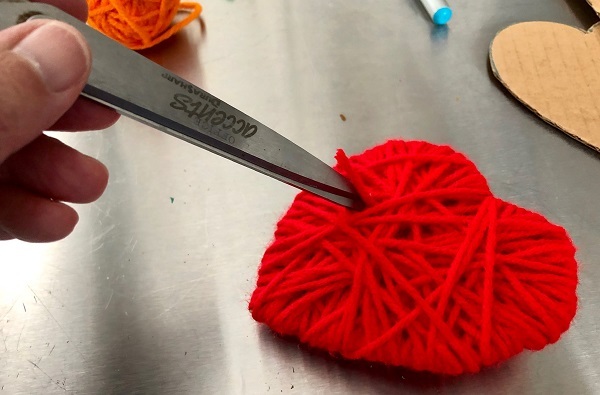 Crafters across the city have spread smiles and love with handmade hearts to help comfort those affected by recent tragedies. Some are knit, others crocheted, handstitched or made from clay and painted. The hearts are left in public spots where people who find them are instructed to keep them or share them with others. 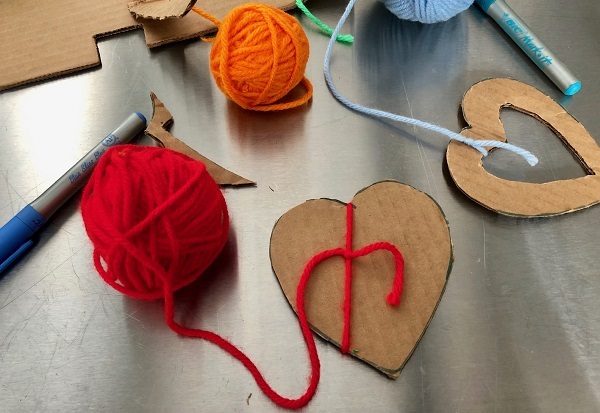 Kids can get in on the trend, too, with this week’s Maker Monday: Yarn Share-A-Hearts. While crafting the hearts, brainstorm about ideas of where to leave them. Perhaps a neighbor’s front porch or a nearby bus stop. Giving away these pretty hearts might feel like a sacrifice for a young maker, but anticipating the smiles they will elicit will be worth it. Draw heart shapes on the cardboard. We traced a cookie cutter to make ours, but you can do it freehand if you wish. Cut out the hearts. 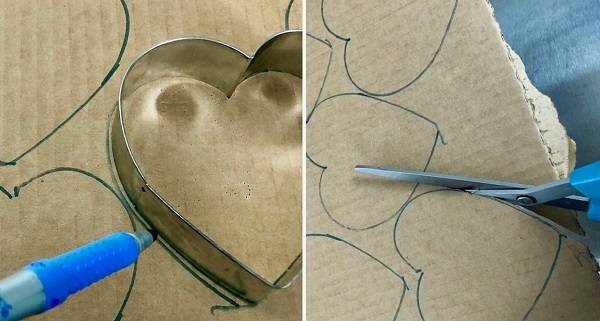 For the open heart, fold a cutout heart in half and trim out the center. 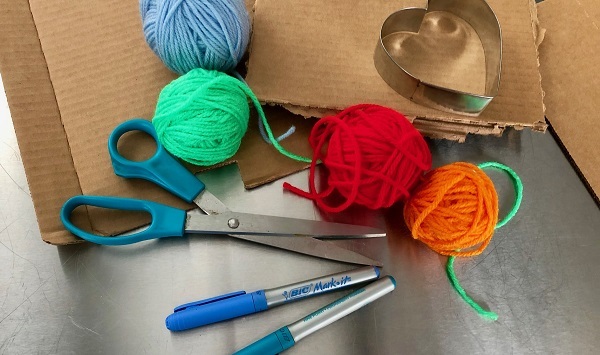 Choose your yarn color and begin by tying the yarn around the cardboard heart. 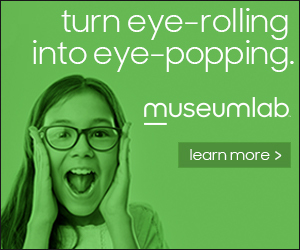 Don’t worry about the loose yarn. It will be covered up once you wind enough yarn onto the heart. Wind the yarn around the cardboard, pulling slightly to keep in place. Write up messages to go with your hearts: “Love > Hate” or “Find it. Keep it. 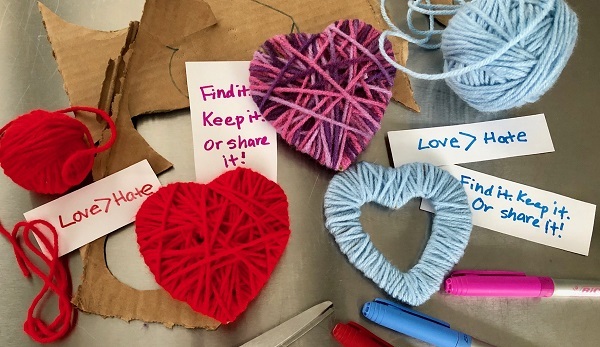 Or share it!” Or you can ask finders to let others know what they’ve found on social media with hashtags like #ShareAHeartPgh, #LOVE>hate and #PGHHandMadeHearts. 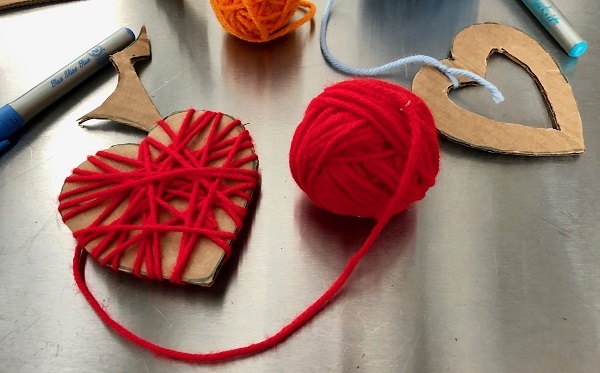 The notes can be tied on to your hearts or tucked into the yarn. Next: Go out and share your heart!